Avène High Protection Spray SPF 50+ (200 ml/6.8 oz) offers high broad spectrum protection against UVB/UVA rays in a convenient pump dispenser for ease of use. Contains both Tinosorb M and Tinosorb S.
Offers high protection for sensitive skin on the face and body. Invisible, non-greasy texture that offers an extremely pleasant application. Apply generously before sun exposure. Reapply as needed or after swimming, towel drying, perspiring heavily or washing. Methylene Bisbenzotriazoyl Tetramethylbutylphenol (Tinosorb M). Bis-Ethylhexyloxyphenol Methoxyphenyl Triazine (Tinosorb S). Butyl Methoxydibenzoylmethane (Avobenzone). 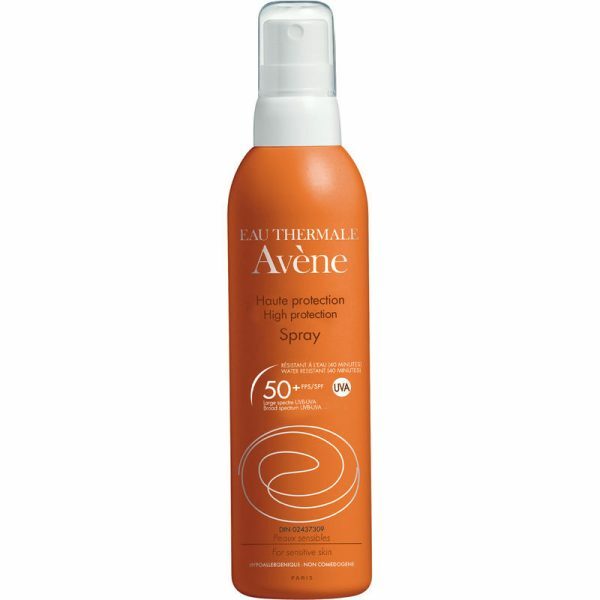 Avène Thermal Spring Water (Avene Aqua). C12-15 Alkyl Benzoate. Dicaprylyl Carbonate. Water (Aqua). Glycerin. Titanium Dioxide. DiisopropylI. Cetearyl Isononanoate. Lauryl Glucoside. Polyglyceryl-2 DipolyhydroxystearateI. Benzoic Acid. Caprylic/Capric Triglyceride. Caprylyl Glycol. Citric Acid. Decyl Glucoside. Dimethicone. Disodium EDTA. Fragrance (Parfum). Glyceryl Behenate. Glyceryl Dibehenate. Propylene Glycol. Silica. Tocopherol. Tocopheryl Glucoside. Tribehenin. Xanthan Gum.